Visitation will be 5 p.m.-7 p.m., Monday, April 8 at Rapid City First United Methodist Church. Funeral services will be held at 1:30 p.m., Tuesday, April 9 at Rapid City First United Methodist Church with Michele Slott officiating. Burial will follow at the Black Hills National Cemetery. Elly’s funeral will be available via livestream on the Rapid City First United Methodist Church website at www.rapidcityfirst.org. Though tiny, Elly Moo was full of unwavering strength. She amazed everyone by breathing on her own for the first day of her life. Always sassy and feisty, Elly loved to keep the NICU nurses on their toes. She liked to pull out her IV’s, swing her arms during diaper changes, and voice her “moos” of protest. Never lacking in personality, her eyebrows would tell you what Elly Moo was really thinking. And not wanting to be underestimated, Elly enjoyed showing-off her ability to touch her toes to her forehead. Elly’s lively spirit won the heart of every staff member of the NICU. “She had a smile that could melt you,” shared one NICU practitioner. Elly’s love of those around her was clear in her delight at being held. When she was not in the arms of someone who treasured her, she was requesting to be. Her favorite place was being held against the chest of her mom or dad, with her big, beautiful blue eyes looking toward them. Every morning at 5 a.m., Elly’s dad would stop at the NICU before work to rock her in his arms as she slept. By March, Elly passed the six-pound mark and was proudly named “biggest baby in the NICU.” On April 3rd, Elly graduated from the NICU after 158 days. She was warmly welcomed home by her parents and eager siblings. However, upon coming home, she quickly became ill with a sudden infection. After fighting courageously each and every day of her life, Elly Moo’s sweet and small body could not fight any more. She took her last breath in the loving arms of her mother in the early morning of April 5th at Rapid City Regional Hospital. Elly’s parents feel a profound gratitude for the amazing NICU doctors, nurses, and staff who held Elly close to their hearts. Elly will be buried at Black Hills National Cemetery, surrounded by the warriors who have protected our country. Elly’s family asks that you please remember their Elly Moo. When you think of her, do not be afraid to mention Elly’s name, so her fighting spirit can be kept alive in the hearts of those who love her. 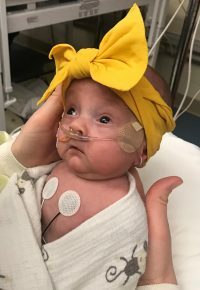 In lieu of flowers or gifts, a memorial has been established to benefit the NICU that provided such exceptional support to Elly Moo for each of the 158 days she was in their care. Grateful for sharing her life are her parents, Jake and Katie, siblings Avery, Karson, and Violet, as well as numerous aunts, uncles, grandparents, and cousins. Elly was preceded in death by great-grandparents John & Marge Arends, Woodrow & Leola Papousek, and great-aunt Marcy Papousek.